Turn your day-to-day tasks into an experience in elegance with the Glyde collection from MOEN. Stylishly simple, Glyde's graceful curves and transitional contours flow as beautifully as the water stream. Two gently arcing lever handles make it easy to adjust water temperature and flow while beautifully framing the faucet. Brightly finished in timeless chrome, this eco-friendly design is also WaterSense certified to ensure efficient water usage while maintaining the performance you expect. The MOEN Adler 4 inch Centerset 1-Handle Low-Arc Bathroom Faucet will serve as the perfect stylish addition to your home. Featuring a polished chrome finish that offers a mirror-like, highly-reflective shine that complements a wide range of bath dicor styles, this versatile faucet includes both a lever handle and a knob handle option, so you can choose whichever is most convenient for you. It was designed to meet WaterSense criteria, conserving water while maintaining peak performance. Turn your ordinary bathroom into a sleek, modern space with the MOEN Banbury 2-Handle High-Arc Bathroom Faucet. Featuring a polished chrome finish that offers a highly-reflective, mirror-like shine for versatile style, this faucet provides ample clearance with a high-arc design that makes everyday tasks easier. This efficiently crafted faucet is WaterSense certified with a 1.2 GPM flow rate for water conservation, and installation is easy with the deck-plate mount and 1/2 in. connection. This new piece from Moen brings fresh water fast and adds a stylish look to any bathroom. If you want to renew the look of your bathroom, this dual-control faucet is perfect. Its deck mounted design fits with many sinks and isn't hard to install. This faucet is WaterSense certified for less water use to give you the same clean. Glyde 4-Inch Centerset 2-Handle High Arc Bathroom Faucet In Chrome Turn your day-to-day tasks into an experience in elegance with the Glyde collection from MOEN. Stylishly simple, Glyde's graceful curves and transitional contours flow as beautifully as the water stream. Two gently arcing lever handles make it easy to adjust water temperature and flow while beautifully framing the faucet. Brightly finished in timeless chrome, this eco-friendly design is also WaterSense certified to ensure efficient water usage while maintaining the performance you expect. 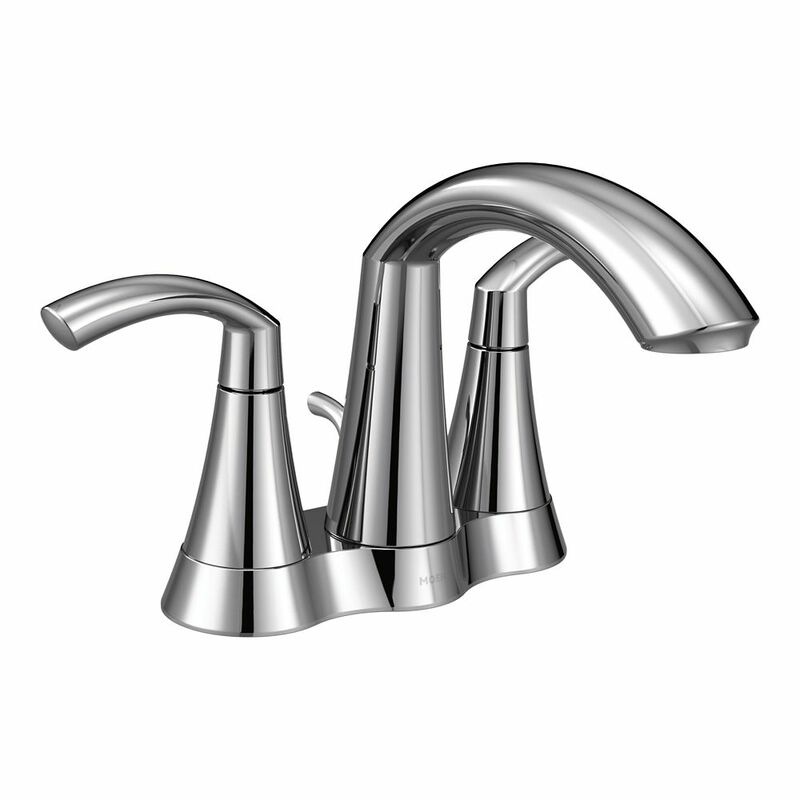 Glyde 4-Inch Centerset 2-Handle High Arc Bathroom Faucet In Chrome is rated 4.5 out of 5 by 6.